Stretching southwards towards the pristine beaches of the Atlantic Ocean, 40 acres of rolling farmland stands ready to become one of the most exclusive enclaves in the bucolic hamlet of Sagaponack. 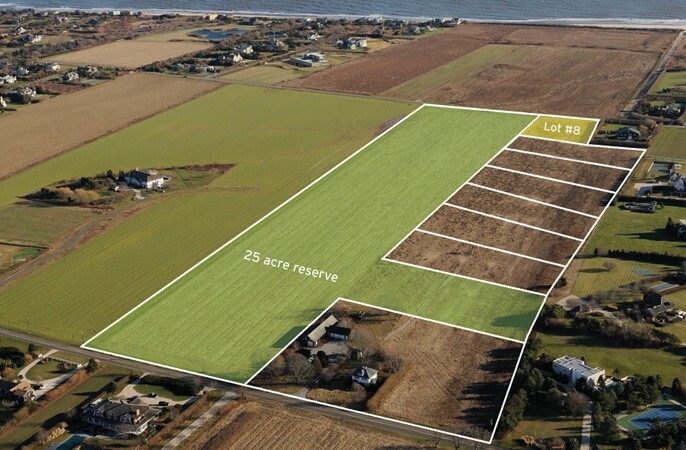 With 8 estate like lots ranging from 1.4 acres to 2.3 acres, Sagaponack Greens additionally has almost 25 acres of farmland preserved for all eternity. Each lot has room for a significant house, pool, pool house and tennis court. See, hear and smell the ocean from any of these perfectly positioned lots. Intriguing possibilities to carve out a family compound for the generations to come. This particular lot on Daniels Lane, only a very short walk to the beach, is 1.49 acres with room for a 6,255 sq ft house on 2 levels, a finished basement, a 938 sq ft accessory structure(pool house, recreational building, detached garage, etc), pool and tennis. All this in close proximity too all that makes the Hamptons a world class resort.